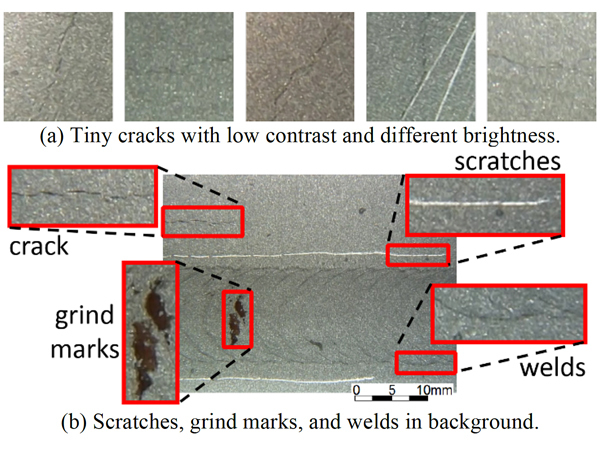 Other automatic crack-detection algorithms under development often do not detect cracks in metallic surfaces because the cracks are usually small, have low contrast and are difficult to distinguish from welds, scratches and grind marks. The new system, called CRAQ, for crack recognition and quantification, overcomes this limitation by using an advanced algorithm and a powerful “machine learning” technique to detect cracks based on the changing texture surrounding cracks on steel surfaces. The automated approach could help improve the state of the United States’ infrastructure, recently given an overall grade of D+ by the American Society of Civil Engineers, said Jahanshahi, director of Purdue’s Smart Informatix Laboratory. A new automated system developed at Purdue University detects cracks in the steel components of nuclear power plants. Here, the system accurately distinguishes between cracks and other features, outlined in red-colored boxes. The United States operates 99 commercial nuclear power plants, which account for about 20 percent of total U.S. electricity generation. Aging can result in cracking, fatigue, embrittlement of metal components, wear, erosion, corrosion and oxidation. Complicating the inspection process is that nuclear reactors are submerged in water to maintain cooling. Other automated crack-detection systems under development are designed for processing single images, whereas the new method processes multiple video frames, providing more robust results. Findings show the system outperformed two others under development. “In contrast to other methods that only focus on detecting cracks in one image, we propose a method called Bayesian data fusion that tracks detected cracks in video frames and fuses the information obtained from multiple frames,” Jahanshahi said. “Moreover, we can filter out falsely detected cracks and increase the reliability and robustness of crack detection by using Bayesian decision theory,” which determines the probability that an object is a crack or a false alarm. Mohammad R. Jahanshahi, left, an assistant professor in Purdue’s Lyles School of Civil Engineering, and doctoral student Fu-Chen Chen review results using the new system. The system assigns “confidence levels,” automatically assessing whether the detected cracks are real and outlining the cracks with color-coded boxes that correspond to these confidence levels. For example, if the algorithm assigns a high confidence level to a crack, the box outline is red. The processing procedure takes about a minute. “Then, a technician could do a manual inspection to confirm that there is a crack,” Jahanshahi said. This explanatory video illustrates the concept. The journal article was authored by doctoral student Fu-Chen Chen; Jahanshahi; doctoral student Rih-Teng Wu; and Chris Joffe, technical leader for Non-destructive Evaluation at the Electric Power Research Institute (EPRI), a nonprofit organization funded by the electric utility industry. Researchers recorded videos using an underwater camera system scanning 304 stainless steel specimens containing cracks and also features such as welds, grinding marks and scratches. Future research will include work to develop a more accurate and more fully automated system using advanced simulations and computational software. “We are currently working on the second version of the software by developing deep learning algorithms to detect cracks for this application where we have significantly improved the performance of the system using convolutional neural networks,” Jahanshahi said. The research was supported in part under a contract with EPRI.